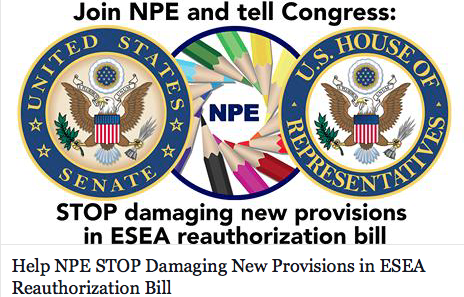 Now that NPE, Fairtest, NEA, and AFT have bought the ESEA bag of radioactive rocks with the liar's promise of gold inside, it is best for them to pretend this deadly gift is going to make us all well. Don't be fooled. Billions are guaranteed for segregated charter privatization to expand exponentially (see pp. 518-575), with charter authorization taken out of the hands of LEAs. Call Congress and remind them that this bill will unleash an era of resistance and civil disobedience they have never seen. Under consideration for passage in DC this coming week is the new states rights version of NCLB, which, if passed, will spawn education policies more racist even than the ones developed under Bush II and the same ones promulgated by Obama. And with federal regulation and oversight by ED smashed by the new bill, the Feds will be unable act to stop any of it, even if they had the will to do so. This sets the nation up for the proliferation of a federally-funded corporate welfare reform school system that adheres to the "broken windows" no excuses chain gang schooling model for the poor, the black, the brown. Who will have the advantage in the war to keep public education and the idea of democratic schooling alive? The states, of course, where ALEC has a portfolio of corporate model legislation to pass out among the states, which are ever more hungry to attract the Gates, Broad, and Walton education dollars that come as payoffs for passage of ALEC's model bills. In opposition will be a tiny underfunded testing and corporate education abolition movement that will be required to organize in each state to fight 50 guerrilla wars against the billionaire Borg. Required will be new levels of civil disobedience and an unwavering willingness to risk arrest and jail. Parents, students, and teachers must mobilize to fight and to act and to defy, rather than to be coopted, subverted, and subdued by endless talk from pretenders and stooges. Call Washington tomorrow morning and let them know what's coming if this corporate charter funding bill passes. Now that the passage is all but assured, Ravitch and NPE have turned their phony opposition to the bill into a fund-raising opportunity. Multi-national capitalists have banned together to protect their obscene wealth and to doom the planet at the same time. This comes even before the vaunted Paris Conference gets underway. Given the choice of a dead world or the neutralization of a few hundred oligarchs, we must wonder now which options humanity will choose. I know--it's a tough choice. They [negotiators] have pointedly declined to take up a recommendation from scientists, made several years ago, that they set a cap on total greenhouse gases as a way to achieve that goal, and then figure out how to allocate the emissions fairly. The pledges countries are making are voluntary, and were established in most nations as a compromise between the desire to be ambitious and the perceived cost and political difficulty of emissions cutbacks. The scientists argue that there is only so much carbon — in the form of exhaust from coal-burning power plants, automobile tailpipes, forest fires and the like — that the atmosphere can absorb before the planet suffers profound damage, with swaths of it potentially becoming uninhabitable. No Child Left Behind gets undeserved credit for making schools pay attention to students living in poverty ("Education's sweet spot,” November 27). Experienced educators have always been aware of the effects of poverty and know which schools and students are the most impacted. Also, educational research has confirmed the negative effects of poverty on learning for decades. Recommending more precise measurements to identify needy schools is like recommending that fire departments invest in expensive and highly accurate thermometers so that firefighters get the exact temperature of dangerous and rapidly spreading fires before trying to put them out. Instead of spending billions on unnecessary testing, let's invest in protecting children from the impact of poverty, i.e. expanded and improved food programs, improved health care, and improved school and public libraries in high-poverty areas. The best teaching in the world has little effect when children are hungry, undernourished, ill, and have little access to reading material. Yep, you heard that right. After Nashville Metro said NO to more ed reform chain gangs, and after the State Board disagreed upon appeal, and after Metro School Board effectively said NO once more, now the State Board is stuck with its own KIPP schools. Wonder if the State Board will also assume the legal responsibility for the children who are regularly mistreated in these penal schools? Spellings, a key architect of No Child Left Behind, made no apologies for an accountability system that is now vehemently derided by schools and parents. Many have that luxury, Spellings said, because it's not their children who are failed by public schools. School districts and board members are always ready with an excuse as to why some children, especially those in poverty, can't learn. "It made people uncomfortable and it still makes people uncomfortable, this idea that adults need to do a better job serving our students," Spellings said. "How can we hold onto that outrage in our heads when only half of our minority students are getting out of high school? How can we hold that idea in our head with the notion that all our teachers are effective and pretty much all the schools are good, but half the kids aren't performing and our workforce is at risk?" Outrage, indeed! Under Spellings' watch, resegregation of schools escalated, labeling and sorting of children became standard school practice, child health deteriorated, school funding became more unfair, teaching became scripted, curriculum was canned, child stress soared as learning waned and play was banned in many schools, school privatization proliferated, and child poverty rose to an all time high. So yes, Margaret, I'm holding the rage. Guest post: What could be wrong with a "community school" model? 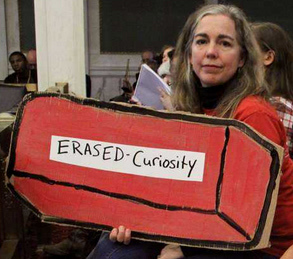 Alison McDowell is a Philadelphia public school parent and a member of the Alliance for Philadelphia Public Schools. This article is an expansion of her testimony to the Philadelphia School Reform Commission on November 19, 2015. While it speaks to developments in Philadelphia, it has national implications. As I see it, two groups are working concurrently on community school initiatives. They hold opposing views about what community schools are. Reformers talk about eliminating the concept of "seat time,” instead they want to promote the idea that you can learn anywhere at any pace. I see that line of thinking as potentially very dangerous if you’re someone like me who values real bricks and mortar schools as a cornerstone of civil society. At the same time there are an increasing number of people who are involved with community school initiatives on the local level. They see community schools as neighborhood anchors. The problem is that they have absolutely no knowledge that there is another powerful group, the corporate education reformers, including Tom Vander Ark, working to undermine all they are doing. No one outside the cabal of corporate education reformsters and their stooges in the U. S. Congress knows the dirty details in the secretive Every Student Succeeds Act (ESSA), and no one will know until a few hours (if we are lucky) before the Congress votes on this ESEA sequel to No Child Left Behind. Apparently, the dissemblers at Fairtest and NPE are willing to accept Ed Week's corporate spin on the new bill, rather than examine it for themselves. After all, the holidays are almost here. the U. S. Secretary of Education is barred from intervening in state-sanctioned segregation or other exclusionary "education solutions" that states may impose on the citizenry. Now these are just a few of the corporate goodies inside this NCLB 2.0 And yet, Diane Ravitch pretends that some significant change has occurred in education policy and that there is reason to celebrate. For those who cherish public education and who oppose high stakes standardized testing and charter privatization, there is nothing to celebrate. But for the moment, let’s celebrate the demise of a terrible law that saw punishment as the federal strategy for school reform. Let’s celebrate that no future Secretary of Education will have the power to impose his or her flawed ideas on every public school and teacher in the nation. Let’s thank Senator Lamar Alexander and Senator Patty Murray for finally ending a failed and punitive law. A week after a St. Louis KIPP administrator was placed on leave, pending an investigation of abusing a kindergarten student whose head and neck showed clear signs of a physical assault, a New Orleans KIPP dean of students has been placed on leave, pending an inquiry into an incident involving a 16 year old female student on November 16. The story below from the Times-Picayune details how KIPP officials offered a very different story of a violent "disciplining" incident than the one told by video images from students at the scene. A 16 year old female KIPP student, who was lifted off the ground by the dean of students in a choke hold, was apparently dragged down the sidewalk in the same position. She was later treated for what doctors described as "cervical strain." Notice in the first photo below that the child's feet are off the ground as she is choked by KIPP Dean of Students, Wilfred Wright. A New Orleans mother says her daughter's dean choked and dragged her down the street at KIPP New Orleans Leadership Academy Monday (Nov. 16). 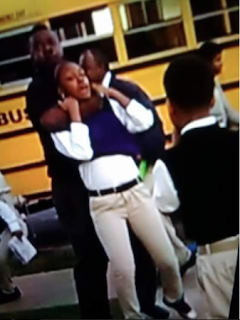 In a photo of the incident, a staff member's arm is wrapped around the girl's neck. Her sweater vest has ridden up; her mouth is open and her feet appear to be slightly off the ground as she grabs at his arm with both hands. KIPP spokesman Jonathan Bertsch said the staff member "was intervening in a fight between two students," and had been placed on leave pending an investigation. Rebecca Solomon initially believed the school's account of the incident, she said Friday. She acknowledged that her seventh-grade daughter, 13, got into a social media spat with another girl over the weekend, and that they were on the verge of fighting physically when she got off the bus at 2300 St. Claude Ave. She asked to withhold her daughter's name for privacy. Solomon identified the man in the photo as dean of students Wilfred Wright. She said Wright told her the girl became furiously aggressive, and demonstrated how he had gently and appropriately restrained her. By Solomon's account, Principal Herneshia Dukes said it took several teachers to hold the girl down. A KIPP incident form Solomon sent NOLA.com | The Times-Picayune said "both girls swung at each other ... while shouting and screaming disrespectful things." Solomon said it didn't add up. "She's not aggressive," she said. The school didn't call her. The girls were given a minor punishment, a one-day, in-school suspension, according to records Solomon provided to NOLA.com | The Times-Picayune. Furthermore, her daughter called Monday morning sobbing, saying Wright choked her, and that when she struggled to get out of the chokehold so that she could breathe, he applied more pressure on her neck. Still, Solomon believed the school, because "I'm not a parent who tries to go against any school officials," she said. "I feel like (they) have the best interests of my child at hand." Indeed, she drives a school bus. But the next day, at a conference, the mother of the other girl showed her a video and photos other students took at the time. "Knots in my stomach started to come. My heart dropped," Solomon said. It didn't look anything like what Wright demonstrated, she said. As she described it: "The video shows that he had my daughter in a chokehold, he had one hand around her neck and she was screaming something" as he was "dragging her down the sidewalk" from the bus stop around the corner to the side entrance. Solomon did not have a copy of the video. A screenshot with a video bar shows the pair down the sidewalk from the bus. She said she took the girl to New Orleans East Hospital Tuesday, where doctors diagnosed a cervical strain. Bertsch would not identify the staffer. He said, "Student safety remains our highest priority, and we act swiftly to address any allegations of inappropriate conduct." Employees are trained "to safely intervene with students when their behavior is dangerous to themselves or others," Bertsch said. That can include removing the student from the situation. Solomon said she couldn't believe it. "I love KIPP. KIPP has done a whole lot academically for my children," she said. In fact, "my daughter likes Mr. Wright. ... She never thought that Mr. Wright would handle any student like that." Solomon said she had filed a complaint with the state Education Department. My book about life in KIPP Model schools will be published by Rowman & Littlefield in February 2016. Pre-publication orders may be made here. Doug Martin speaks on his book Hoosier School Heist at the Purdue Social Justice Coalition's November 12, 2015 event entitled “Exposé: The Profit Motive Behind Public Education Reform in Indiana.” Introduction by Dr. Bill Mullen, a Purdue professor and writer for the Socialist Worker. Plus, the Purdue Social Justice Coalition's Tiffany Montoya gives an update on the many protests going on at Purdue. It has come to my attention that the Monty Neill, the head of Fair Test, in issuing a statement about the Opt- Out Movement's tremendous progress refused to list any leaders of United Opt Out as local contacts for the movement despite repeated requests by UOO leaders to do so. This comes several months after a leader of Network for Public Education produced a brief history of the Opt Out movement that tolally left out the contributions of United Opt Out and its leaders. I find this exclusion of United Opt Out from narratives of a movement they did so much to start and which they play a leading role in deeply troubling. Whatever the reasons for this "freeze out,"
it is unconscionable and unacceptable. The uncompromising militancy of United Opt Out and the fierce integrity of its leaders is a tremendous asset to students, teachers and families facing well financed efforts to privatize the nation's schools. I support them 100 percent. They are among the best fighters we have. The decline in college graduates has two obvious sources: The huge expense of college in a time of economic difficulty for everyone but the super-wealthy, and the growing understanding that college might not be the best route for everybody, despite the administration's push for increased college graduation rates. Former US Secretary of Heath, Education and Welfare John Gardner warned us of the consequences of not paying attention to other forms of post-secondary education: "The society which scorns excellence in plumbing as a humble activity and tolerates shoddiness in philosophy because it is an exalted activity will have neither good plumbing nor good philosophy: neither its pipes nor its theories will hold water."